"to provide a residence or home for such old people who are either resident of Hythe town or surrounding district, or who are related to a person or persons resident in Hythe town, as the Committee in their discretion think fit provided preference shall be given to persons resident in Hythe town"
Tynwald continues to be run by a committee of voluntary trustees. Any surplus money is used for the benefit of the residents. Tynwald offers a varied, year-round programme of activities which residents are invited to join in with as much or as little as they wish. 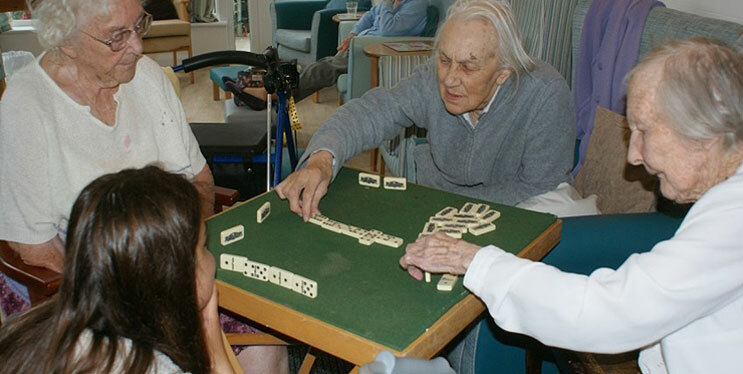 The Trustees, Managers and staff understand the importance of doing everything they can to keep residents active, occupied and entertained. The full-time Activity Co-ordinator is responsible for organising and delivering the activity programme, including the recruitment of volunteers, hiring musicians and performers, and organising trips out. Members of the local community are involved throughout the year, and especially for the festive season and special events. Local traders contribute to the annual Strawberry Tea garden party and musical and dance groups supplement the weekly professional entertainments. Tynwald is supported by a dedicated team of volunteers who visit regularly to provide additional activities, outings or just a friendly chat. Every week Transition Hythe and a group of people with learning disabilities tend the garden, much to the enjoyment of the residents. Residents are also visited by young people working towards the Duke of Edinburgh Award. "All of the staff are endlessly patient, it matters to each one of them that the people here are well looked after." "The food is lovely. I'm looking forward to lunch." "The staff couldn't be kinder, they are warm and sincere."